Bible prophecy: How will the world end? Phase 1- Beginning of sorrows (Matthew 24 vs.5) – For many will come in my name, claiming, ‘I am the Christ,’ and will deceive many. Many shall proclaim themselves to be false ‘Jesus’ and false ‘messiahs’ and succeed in deceiving many. (Matthew 24 vs. 5) – For many will come in my name, claiming, ‘I am the Christ,’ and will deceive many. There shall be civil wars and rumours of impending wars (Matthew 24 vs. 6) – You will hear of wars and rumors of wars, but see to it that you are not alarmed. Such things must happen, but the end is still to come. Nation shall wage war against themselves and ethnic groups and kingdoms shall wage war against one another (Matthew 24 vs. 7) – Nation will rise against nation, and kingdom against kingdom. There shall be drought, famines and recessions (Matthew 24 vs. 7) – Nation will rise against nation, and kingdom against kingdom. There shall be outbreak of diseases, illnesses and sicknesses (Matthew 24 vs. 7) – Nation will rise against nation, and kingdom against kingdom. 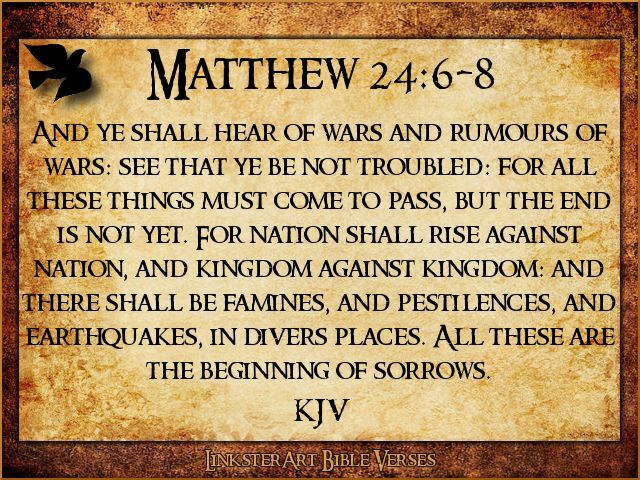 There shall be earthquakes and tremors (Matthew 24 vs. 7) – Nation will rise against nation, and kingdom against kingdom. There shall be great persecution of Christians (Matthew 24 vs. 9) – “Then you will be handed over to be persecuted and put to death, and you will be hated by all nations because of me. Christians shall be killed and murdered (Matthew 24 vs. 9) – “Then you will be handed over to be persecuted and put to death, and you will be hated by all nations because of me. Christians shall be hated throughout the world (Matthew 24 vs. 9) – “Then you will be handed over to be persecuted and put to death, and you will be hated by all nations because of me. There shall be upsurge of false prophets who will succeed in deceiving many (Matthew 24 vs. 11) – and many false prophets will appear and deceive many people. The gospel shall be preached to all nations as a witness (Matthew 24 vs. 14) – And this gospel of the kingdom will be preached in the whole world as a testimony to all nations, and then the end will come. Christians shall flee to mountains, fields, and housetops to escape the great tribulation. There shall be great tribulation against Christians, never experienced (Matthew24 vs. 21) – For then there will be great distress, unequaled from the beginning of the world until now — and never to be equaled again. The days of tribulations shall be shortened to save the elect (Matthew 24 vs. 22) – If those days had not been cut short, no one would survive, but for the sake of the elect those days will be shortened. False prophets, Christ shall appear doing great signs and wonders; and deceiving many (Matthew 24 vs. 23-24) – 23 at that time if anyone says to you, ‘look, here is the Christ!’ or, ‘There he is!’ do not believe it. 24 For false Christs and false prophets will appear and perform great signs and miracles to deceive even the elect — if that were possible. People shall falsely announce the second coming of Jesus Christ and say He has arrived in a secret place (Matthew 24 vs. 24-25) – 24 For false Christs and false prophets will appear and perform great signs and miracles to deceive even the elect — if that were possible. 25 See, I have told you ahead of time. A sign shall appear in heaven heralding Jesus Christ (Matthew 24 vs. 30) – “At that time the sign of the Son of Man will appear in the sky, and all the nations of the earth will mourn. They will see the Son of Man coming on the clouds of the sky, with power and great glory. All the people of the world shall weep for they know the end has come (Matthew 24 vs. 30) – “At that time the sign of the Son of Man will appear in the sky, and all the nations of the earth will mourn. They will see the Son of Man coming on the clouds of the sky, with power and great glory. Jesus shall appear in the clouds with power and great glory (Matthew 24 vs. 30) – “At that time the sign of the Son of Man will appear in the sky, and all the nations of the earth will mourn. They will see the Son of Man coming on the clouds of the sky, with power and great glory. Angels shall appear with him (Matthew 24 vs. 31) – And he will send his angels with a loud trumpet call, and they will gather his elect from the four winds, from one end of the heavens to the other. A trumpet shall be sounded (Matthew 24 vs. 31) – And he will send his angels with a loud trumpet call, and they will gather his elect from the four winds, from one end of the heavens to the other. The elect from all the ends of the earth and heaven shall be gathered together.